Ever since I first saw Christopher Cascio's artwork (on view now at Front Gallery), I've liked it. Cascio falls in the tradition of artists who do things obsessively, whether in their art (for example, Tehching Hsieh or John Adelman) or in their life--or both. His work documents obsessive behavior--his own and that of others. In Text 2010, the act of creating it is the obsessive act. 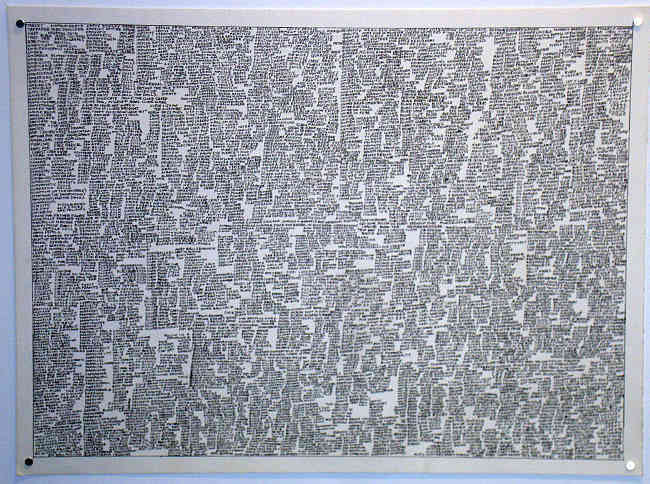 It consists of short phrases arranged in irregular columns written in tiny, cramped hand printing. The phrases here are related to one another--there are rhymes and repeated words. 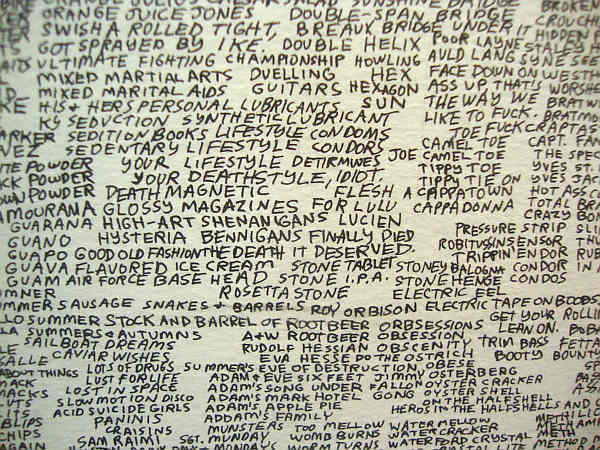 It looks like it could be a list of possible band names. That fits in the general theme here. 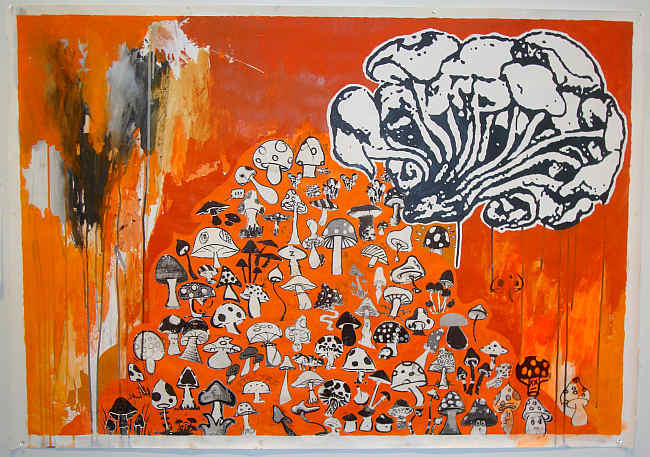 The work is about adolescent and post-adolescent stoner obsessions. Drugs, of course, but also records, music, stereo equipment, and beer. 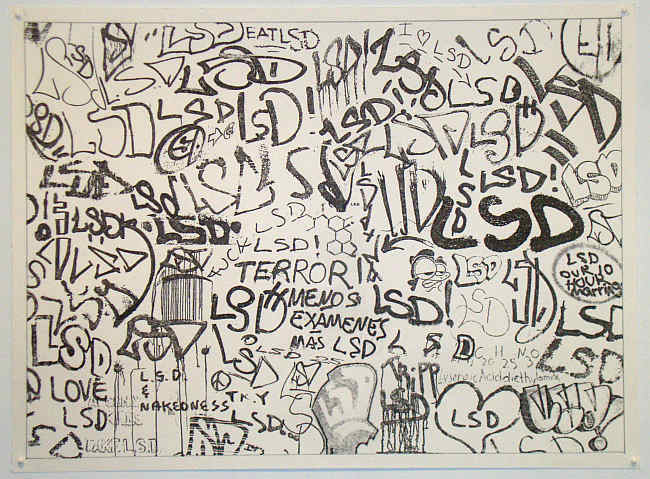 LSD Tags looks like a catalog of things written with markers on walls, lockers, and school desks. In short, the work of bored high school students. The question is whether or not Cascio went around carefully recording (photographing?) these tags whenever he saw them or if he just improvised them himself. My feeling is that he did the former--the styles seem to varied to be from one person's hand. And if so, it speaks to a lengthy period spent tracking down "LSD" graffiti. The work becomes as much a piece of urban anthropology as it is a piece of visual art. Untitled (Super Hits) speaks of the constant search for new music, hitting the bargain bins at Half Price Books. I can relate. I practically lived at the Half Price Books and Records (as it was then called) on Waugh at Hyde Park when I was a teenager. 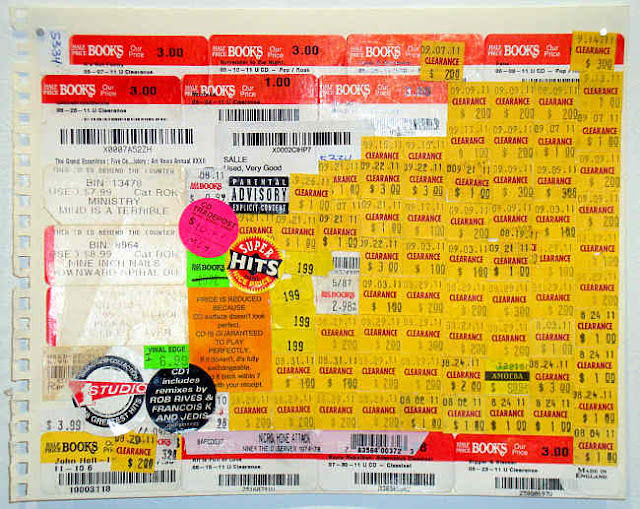 But Cascio goes one step further--he saves every sticker and fills notebooks with them. There's something a bit mechanical about this. Its sheer repetitiveness bespeaks a certain mental state, so one can't call it inexpressive. But one does long for some sense that the artist is moved in some way by his obsessions. What does music mean to him? What does he get out of this continuous pasting down of price tags and labels? Mushroom Mound goes a lot of different directions at once. We have the mound covered with cartoonish mushrooms (which makes me think of Trenton Doyle Hancock). We have the big high-contrast image of magic mushrooms on the upper right, and the painterly grey, black, white and orange area in the upper right.We get cartoon representation, realistic (possibly even photographic) representation, and abstraction in one work. This is a piece that has Cascio expressing something beyond pure facts. Cascio's work deals with addiction, which could be considered an extreme form obsession. But he places it within a context of a certain type of person at a certain age in a certain place and time. With this show and with his recent excellent show at Cardoza Fine Art, his collages dealing with drugs have a nostalgic quality due to their source material (old issues of High Times). For a guy my age, that recalls jellies (our word for stoners in high school--I have no idea where it came from) listening to Black Sabbath or Deep Purple. Cascio is not that old, but the archetypal teenage stoner has remained a constant over the decades. On one hand, I want to see Cascio move beyond that subject matter at some point. But on the other hand, I think it's really good work.